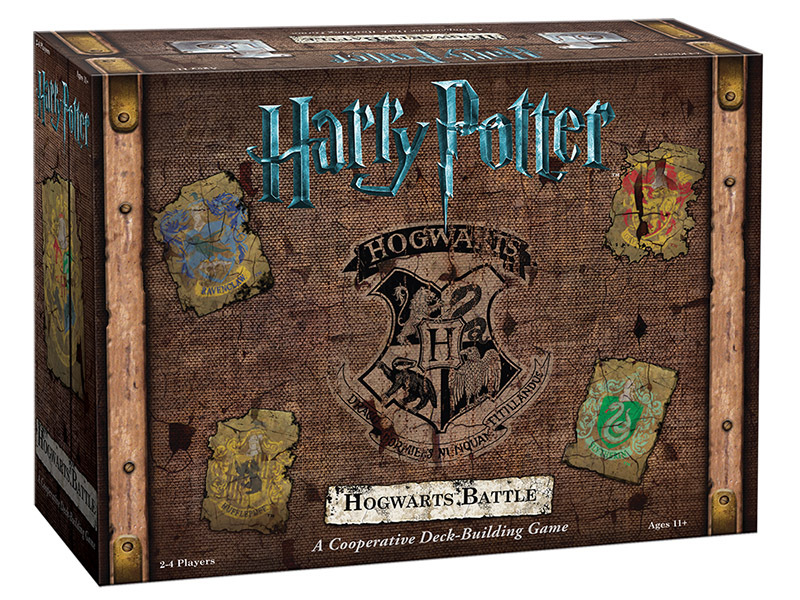 Harry Potter Hogwarts Battle is a Cooperative Deck-Building Game made by USAopoly. In the game, you and your friends assume the roles of wizarding students: Harry, Ron, Hermione and/or Neville. Then you will work together with your friends to take down the villains from each Harry Potter Book successively. You’ll start off with Book 1, taking on the likes of Malfoy, Crabbe and Goyle, but by the end of the 7 book campaign you’ll have to destroy Horcruxes, and defeat Bellatrix and Voldemort. What’s in the Hogwarts Battle box? What is a Deck Building Game? A deck-building game is a card game where players construct the strongest deck they can as the cornerstone of gameplay, in order to defeat their opponents. Typically, Deck Building Games provide a type of game currency which allows players to buy more cards to add to their decks. You will try to buy better cards during the game to make your deck stronger. Most Deck Building Games provide a complete set of cards in the box, and you don’t need to buy anything else to enjoy the game – unlike card games like Pokemon and Yu-Gi-Oh! Some of the more popular Deck Builders are Clank!, Star Realms, and Dominion. In a cooperative game, players work together in order to achieve a goal. The players typically play against the game and the game’s controlled villains. In typical board games, there is one winner, and everyone else loses. In Cooperative games, you win or lose as a group. Some of the more popular Cooperative games are Pandemic, Arkham Horror and Forbidden Island. Cooperative games are great for families and close friends. Here is a simple overview of game play. Evil is threatening to overrun Hogwarts Castle and it’s up to four students to ensure the safety of the school by defeating the villains. In the game, players take on the role of Harry, Ron, Hermione or Neville, and players work together to take down the villains. The game eases players into the rules of deck builders. So this is a great introduction into deck building games for newer players. 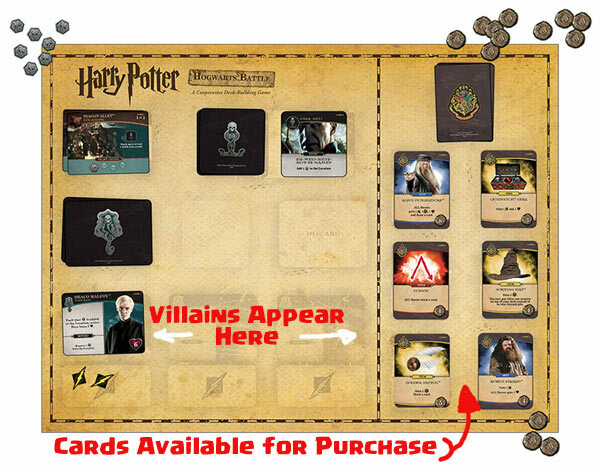 Each player will take their own customized starting deck (example: Harry grabs his personalized Potter deck and all it’s glorious cards). Harry starts with 10 health points, and some knowledge of some rudimentary spells as new Wizarding student. 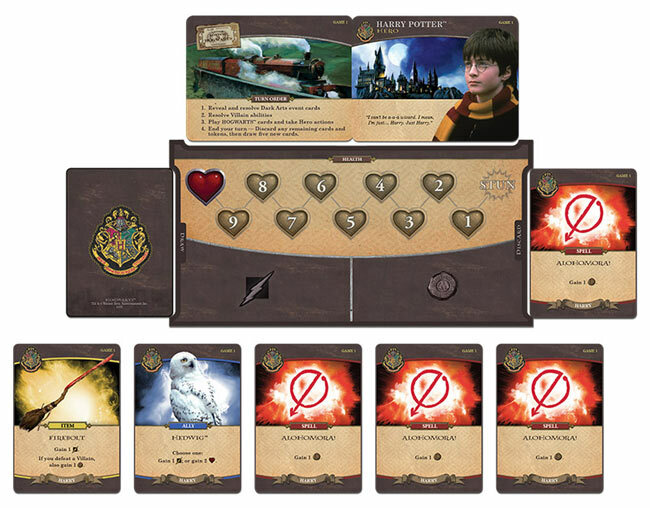 As you play as Harry, you will generate influence (basically money), allowing you to buy more cards to improve your deck. These cards will be in the form of iconic characters, spells, and magical items. Villains will attempt to set back players with their attacks and Dark Arts. There are 7 games you can play from the book. 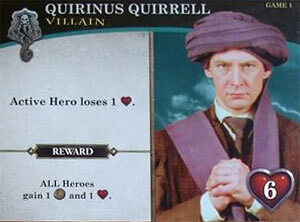 First you will play events in Book 1, and keep Professor Quirrell from getting the Sorcerer’s Stone. Each round, the heroes will try to defeat the villains as they appear during their turns. The heroes will also to try to make their decks stronger. The villains will also get their turn to attack you. If you defeat all the villains before they accomplish their evil plans, you win. Then you move on to book 2. In Book 2 you will tangle with the Chamber of Secrets. The games will get progressively tougher, as you’ll have to fight more villains, and they will be tougher. But you will have learned some stronger spells along the way, and have access to stronger comrades to help you as well. Beautiful Artwork and good quality cards – There is a lot of awesome licensed movie artwork here from all 8 movies. You get to see the kids grow up right in front of you as you progress through the books. Easy to Teach / Easy to Learn – This is a great introduction into deck-building games. The box says ages 11+, but brighter/younger kids probably could pick this up pretty well. Great Box Design – It’s unique that you have no clue what your getting in the next box. You don’t look at Game/Book 4 until you beat Games/Books 1, 2 & 3. Component quality is good too. Rulebook – The rulebook explains the game quite well. Rules will change as you progress through the game. You learn simple fundamentals. Then beat a book. Then a new book is tossed at you, and you learn more fundamentals. Cooperative – This is a great Cooperative game. And it feels like each player is in charge of their own choices. Sometimes, in games like Pandemic, people will submit their choices to the most experienced player. This Harry Potter game feels like each player is making their own choices, and improving their own decks. Deck Building – Each game will have a different feel to it, because every time you play it, your deck will be built completely different. And each character has some spells they know better than the other players. No Dying – Players get stunned when they run out of health. They lose a turn, but they don’t die. I thinks that great for newer players. You don’t want anyone getting knocked completely out of a coop game. Helping Others – A lot of your cards help your teammates. That’s pretty cool. Theme is awesome! – Some games themes can horrible. But the theme here awesome! Simple Deck Building – Using the same spell over and over is boring and too repetitive. If you look at the Harry Potter hand above, you have 3 Alohomora spells in your hand. You could even have 4 in your opening hand. That just feels a bit strange if that’s all you can do. Luck and Randomness! – Villains will appear from the villain pile in a random order. And sometimes the strongest villains will appear at the very beginning of the game, while you are still holding nothing but those crappy Alohomora spells. There are times you wish the strongest villains appeared last. Limited Replayability – This game is fun, but I’m not sure how often folks will come back to it once they’ve beaten Book 7. I had a lot of fun playing “Harry Potter: Hogwarts Battle” with my family. We all already knew how to play deck building games, so it was easy for us to pick up and understand. Games 1, 2 and 3 are very simple. I think the simplicity of the first 3 games/books makes this game a wonderful introduction into deck builders for many players. This is a very easy deck-building game to learn for new players! Games 4-7 can be tough and even frustratingly tough, even for experienced deck builders. In Book 7, Bellatrix can be a crazy strong opponent to take down. But if you can take her down, and win Game 7, it is extremely rewarding. Playing through all the books/movies in order is great. It’s fun, and brings back a lot of great memories. 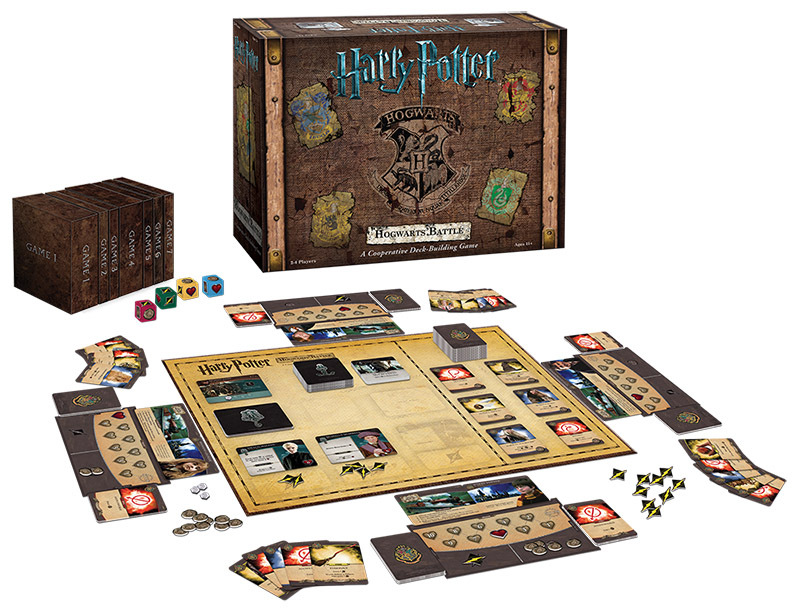 If you are any kind of Harry Potter fan, I feel this is a “must-own-game” for you. I think you will thoroughly enjoy playing through all 7 books. That being said, I’m not sure where replayability lies with this game. Once you’ve beaten all 7 books once. You’ll only want to replay Book/Game 7. But beating book 7 can be difficult, so maybe you’ll want to play it again and again? Or, you could treat this game like a good “Escape Room” type game. The game essentially tells the complete story of Harry Potter. You play it thoroughly until you beat it, and you thoroughly enjoy the experience of beating each book and then you’re done.